Your bulky 4k videos max out iPhone storage. Your chaotic songs mess up music library. Your HD records and HEIC photos run into format issues. Your valuable data are exposed to cybertheft attacks. 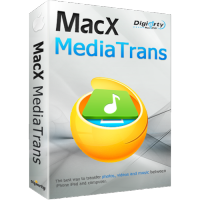 Meet MacX MediaTrans – your best iTunes alternative. Secure, backup and transfer photos, music, videos, ringtone, ibook, iTunes purchases, etc, all in one fell swoop. Say goodbye to data loss or snooping.